Unique design of this Quick Release Triangular Pad lets you do multi-tool sanding with this standard size attachment pad. This sanding pad is ideal for finishing work on most firm surfaces right into the corners for added versatility. 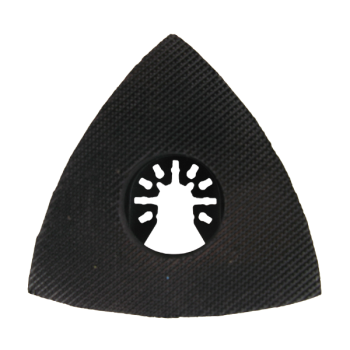 This premium hook and loop (Velcro) triangular sanding pad is perfect for sanding jobs utilizing quick attach hook & loop sandpaper. For multi-tool sanders not requiring vacuum dust extraction systems. Our Q019 Triangular Sanding Pad is a universal replacement size multi-tool Velcro hook & loop sanding pad which accommodates our standard size pre-cut sandpaper pieces.